La Cañada Unified School District has outdone itself once again, continuing its upswing in academic performance and outpacing other high-achieving local school districts to top the statewide charts in English and finish second in math, according to test scores released this week by the California Department of Education. The California Assessment of Student Performance and Progress System mean scale score results show that LCUSD scored in first, second or third place in the state in all grade levels in the testing for English language arts. The district improved its overall English score from 2017 by 1.89 percentage points. In math, three out of seven grade levels were in the top spots. Seventh-graders took first place in English compared to all of their peers tested in California. As a district, LCUSD was No. 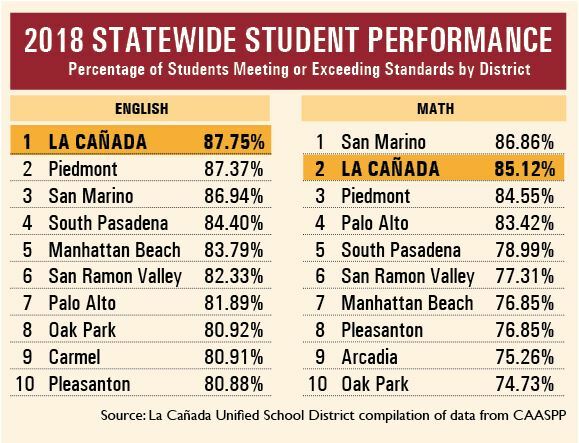 1 in California in the combined percentage of students who met or exceeded state standards in English and had the second-highest percentage in mathematics. 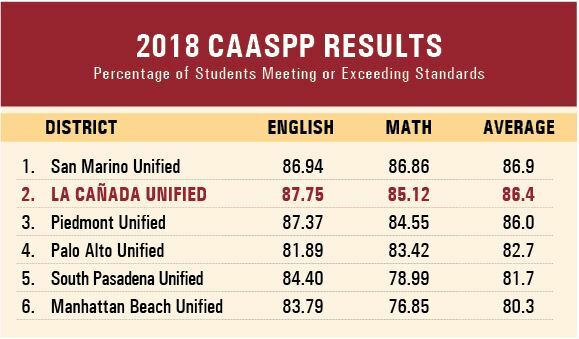 “LCUSD should be proud of these excellent scores that tell the tale of hard work, academic rigor and high performance of our students,” said Jim Cartnal, the district’s executive director of student services, adding that CAASPP scores show important growth from past years across all grades in the district. Under the CAASPP System, students took the testing, the Smarter Balanced Summative Assessments, in the spring of 2018. This is the fourth year of the computer-adaptive tests, which are administered to students in grades 3-8 and 11. The scores are analyzed by mean scale score and student performance is reported in one of four achievement levels: standard not met, nearly met, met and exceeded. LCUSD students earned top honors in English, with 87.75% of students meeting or exceeding the state target in English, compared to a state average of 48.56%. The math scores show that 85.12% of LCUSD students met or exceeded the standards set by the state, far above the statewide figure of 37.56%, to earn second place overall. LCUSD Superintendent Wendy Sinnette also praised the district, but said she’s not surprised by the stellar scores. Though scores were strong across all grade levels, the 3rd, 4th and 7th grades set high performance marks in English in the four-year history of the CAASPP assessment, with the 4th and 5th grades seeing similar record performance in math. Cartnal noted that district administrators and teachers will use these metrics to improve instruction and differentiation in the classroom and to support students. Teachers review CAASPP results both for their current and former students to identify areas of strength in student performance as well as targeted areas of growth Underpinning the district’s scores, La Cañada Elementary School students in grades 3-6 showed important growth in math, with 97.30% of 4th-graders meeting or exceeding state standards. In English, 5th-grade students were at the head of the classes, as 96.55% met or exceeded the state targets. At Palm Crest Elementary School, grades 3-6 all increased scores in English, with the 5th grade earning top honors as 93.75% met or exceeded state standards. Meanwhile, Paradise Canyon Elementary School saw its already high scores improve in math among 3rd- and 5th-graders. In English, PCY grades 3-5 saw excellent growth. As part of the effort to gauge a more holistic approach to student success, the state Department of Education will weave the CAASPP results into the newer California Dashboard accountability system, which also considers chronic absenteeism, suspension rate, English learner progress, graduation rates and college or career readiness. Dashboard results, released for the first time in 2017, are scheduled to come out later this academic year.